(CNN) -- France has awarded its highest decoration to veteran CNN correspondent Jim Bittermann. 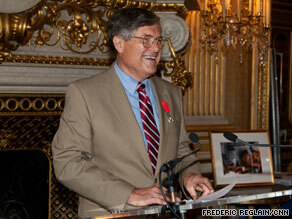 CNN's Jim Bittermann at the special ceremony in Paris where he was made a chevalier. At a special ceremony presided over by the Foreign Minister Bernard Kouchner in Paris Tuesday, Bittermann was presented with the "chevalier" (knight) of the National Order of the Legion of Honor. Bittermann, CNN's senior European correspondent based in Paris, said: "For the past 30 years, I've been explaining France and the French to the rest of the world." During his career with CNN in Paris Bittermann has covered the death of Princess Diana, the last days of Yasser Arafat, the French triumph at the 1998 World Cup and the Concorde air disaster. He joined CNN from ABC News, where he was a Paris news correspondent from 1990-1996; before that Bittermann was a European correspondent for NBC News. He began his career in broadcast journalism in 1970 in Milwaukee. Founded in 1802 by Napoleon Bonaparte to recognize outstanding accomplishment, the chevalier is given annually to around 3,500 Frenchmen and women -- but few non-nationals. Of the 13 honorees this year from outside France, two are American. Previous non-French recipients include former U.S. President Dwight D. Eisenhower, fillm legends Charles Chaplin and Orson Welles and Norman Schwarzkopf, who led allied forces against Iraqi ruler Saddam Hussein during the first Gulf War. Apart from his work for CNN, in recent years Bittermann has been a featured speaker at journalism events such as the International Diplomacy Institute, as well as lecturing and moderating panels at the World Economic Forum in Davos. In 1999 Bittermann was appointed a professor at the American University of Paris, teaching courses broadcast news, writing and production and politics and media among others.